Yes, that really is a shot of my pantry. No, it’s not pretty. What is also not pretty is my reliance on Uncle Ben for quick brown rice. It’s really quite seductive…a mere 90 seconds from pouch to plate. But on a per serving basis, I’m getting the short end of the stick. For what I probably paid for those two pouches of Uncle Ben’s parboiled brown (especially if they weren’t on sale), I could have gotten myself a whole bag of rice. Maybe even something fancy and exotic like brown basmati. And instead of only having enough rice for two meals, I could have had enough rice to easily last a month. Maybe longer. I’m here today to declare my independence from Uncle Ben and his quick and easy microwave rice. I won’t resort to fear mongering, smear campaigns, or dirty politics. I will just say there is another candidate I like better. One who will not contribute to a deficit in my household disposable income; one who will carry on without carrying on; one for whom a cover up isn’t a career ender, it’s part of the job description. 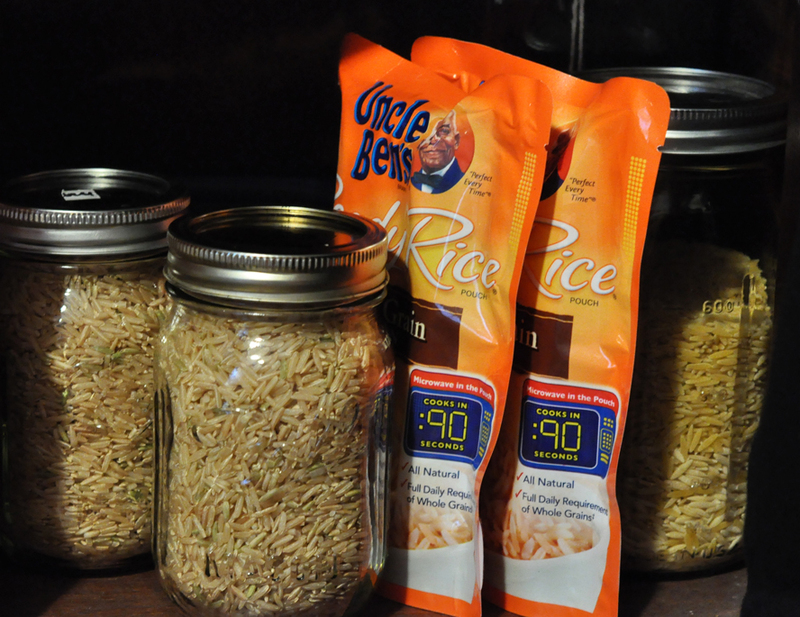 BAH Note: This will make enough rice for you to have leftovers which can easily be microwaved…just like Uncle Ben’s. Bring the salted water to a boil over high heat in a 2.5 quart or larger pot. Once the water come to a boil, add the rice, reduce the heat and simmer uncovered for 30 minutes, stirring occasionally. Drain the rice and return it to the pot. Cover the pot and let the rice sit for 10 to 15 minutes before serving. My go-to recipe for brown rice is Alton Brown’s–you bake it in the oven. This sounds even simpler! Kitch, I think I tried Alton’s baked brown rice recipe and I didn’t like it.� I’m all about the simple solutions! It can be difficult for me to squeak brown rice into the rotation due to my husband’s dependence on traditional rice pilaf. I should do it more often though to reap the health benefits. i’m a white rice kinda girl, always have been. d introduced me to brown rice and the amount of time it took to make it turned me off. until i made it in my rice cooker. i have never see rice made this way: boiled and then drained. is it a hot mess? Oh man, Wendi–clearly you need a rice cooker!! Clearly. It will serve you for so many years, and you don’t even have to worry about watching a pot and burning rice to the bottom of it or anything. I’ve only recently learned how to cook rice… Great tutorial! I really should eat it more often. I’ve got brown rice simmering on the stove right now! I do 1 cup rice to 1.5 – 2 cups water (I don’t like it mushy). Bring to boil, covered, reduce heat to low, simmer 40 min. Done, no draining required. I make it in big batches since it takes so much longer than white rice to cook, and I freeze it in 1 cup portions so I’ve always got a quick and easy solution waiting. I have to admit that I can’t remember much about this rice…the drawback of writing and scheduling posts in advance. So I think I need to revisit this method and also try the one suggested by @themuffinmyth and report back. The batch I made yesterday used 2 cups of brown rice and 3 1/2 cups of water. Cooke up perfectly, no mushy rice! Had some for lunch yesterday, some is in the fridge for dinner tonight, and some if the freezer for a busy day. Goodbye Uncle Ben! So that ratio works out to be 1 3/4 cup water to 1 cup of rice. That should be easy enough to remember. I love making rice in my rice cooker. It’s so darn simple. When my parents bought me a rice cooker for Christmas a few years ago, I (silently) wondered if it were one of those gifts I’d never use. I definitely use it and love it!